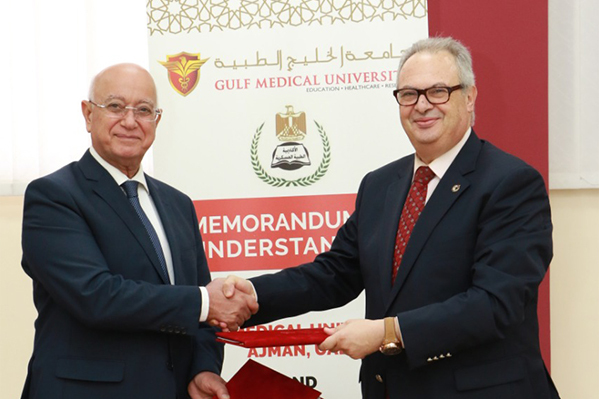 A Memorandum of Understanding for collaboration between the two institutions was signed at the GMU campus on 5th November 2018, by Prof. Hossam Hamdy – Chancellor of GMU and Major General Dr. Ahmed Al-Taoudi – President of the Military Medical Academy, representing the respective institutions. Prof. Hossam Hamdy said that the MoU was an official agreement to formalize the relation between both the institutions. “GMU has been collaborating with MMA on various fronts for some time now, but this agreement formalizes it. The agreement includes offering joint programs and training for professional development, including in areas such as Aviation Medicine, Diving Medicine, Hyperbaric Oxygen Theapy, Trauma Management, etc. The jointly developed programs will be delivered to students and graduates as well as to physicians and health professionals,” he explained. Major General Dr. Ahmed Al-Taoudi described GMU as an “impressive facility with state-of-the-lab research facilities and advanced labs.” He said that he was particularly impressed by the labs of GMU, which enables teaching and diagnostic testing to coexist, providing an exemplary model of integration highly beneficial for the students to expand their practical knowledge and understanding. He was also highly appreciative of the student-diversity and the harmonious environment for students from 80+ nationalities to bond and cooperate with each other on the path to their healthcare careers. “The MMA offers several trainings, Masters and Doctoral degrees in Aviation Medicine, Diving Medicine, Mass Casualties etc. We will collaborate with GMU to offer these programs for the first time in the Gulf region,” he added. Major General Dr. Ahmed Al-Taoudi said that research is an important area where both the institutions can collaborate. “The collaboration between MMA and GMU aims to benefit students as well as patients. There is a lot of scope for teamwork between both the institutions. The MoU will facilitate mutual student exchanges for clinical training,” he said.